A documentary about the implications of taking contemporary art to the Lacandon Jungle, on the border between Mexico and Guatemala, in the only area in Southern Mexico where going “north” implies arriving to Central America. Twenty-one works from the Americas and Europe are displayed here, in exile as it were, from museums and cities to be displayed on site. Frontera implied a constant struggle between a deep reflection on socially engaged artistic practices and the images of an other reality that holds fast against the poetical whim of their creators; a film inspired as a “fitzcarraldesque” gesture. The curatorial approach was awarded an international prize in 2008 (Best Art Practices, Bolzano Province, Italy). 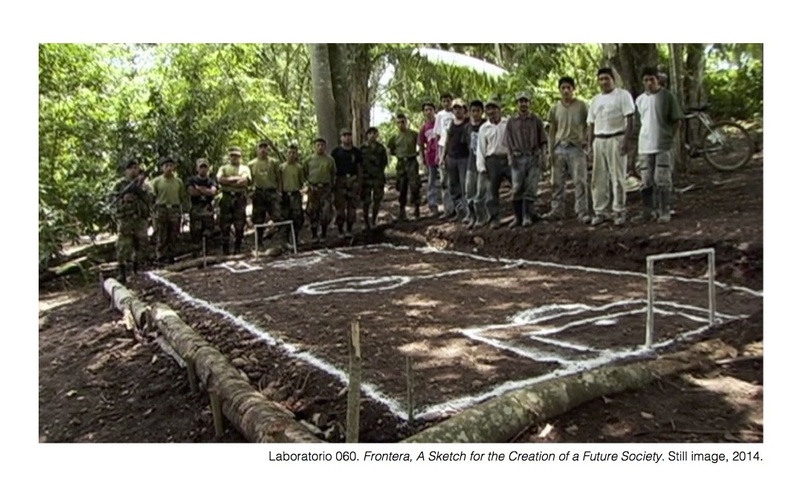 Participating artists in the Frontera project: Néstor Batres, Carlos Bunga, Eder Castillo & René Hayashi & Antonio O’Connell, Gilberto Esparza, Sandra Gamarra, Ariel Guzik & Yolanda Gutiérrez, Yasmín Hage, Pablo Helguera, Jesús “Bubú” Negrón, Enrique Ježik, Laboratorio 060, Aníbal López, Isabel de Naverán & Jon Mantzisidor, Miguel Ángel Madrigal, Ives Maes, Ronald Morán, Diego Pérez, Beatriz Santiago, Tercerunquinto, Miguel Ventura.